Lee Berg left a tape before he died, where he describes what he saw the day his division liberated the Dachau concentration camp on April 29, 1945. As a first lieutenant in the 102 Infantry Division of the Army, Berg earned a bronze star following his heroism at the Battle of the Bulge. When the war was over and he got back to his Dallas home with his family, he kept the star and the images of horror locked away until he filmed the tape. The four-and-a-half-hour tape includes the haunting memories of human misery and torture of the captives’ conditions at Dachau. But Fran Berg said when her father came back he didn’t want to discuss his experiences with anyone, at least not until before his death. Berg is the commissioner with the Texas Holocaust and Genocide Commission. 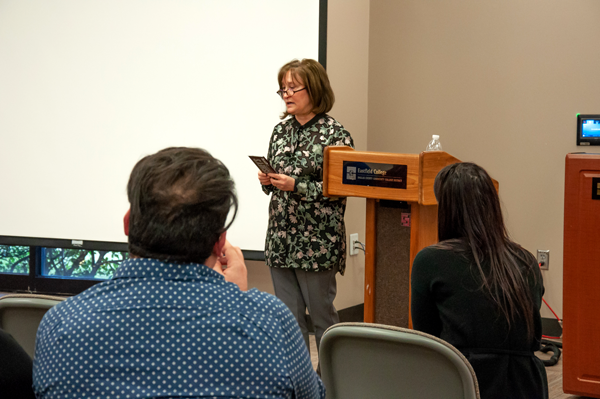 She presented her father’s and other liberators’ stories at the Texas Liberators: Witness to the Holocaust event Nov. 28. Berg said the commission was built because they knew there would be many veterans who would tell their stories to their children, but also many like her father who never spoke a word about it. The presentations are designed for people to feel like the liberators are personally speaking to them. 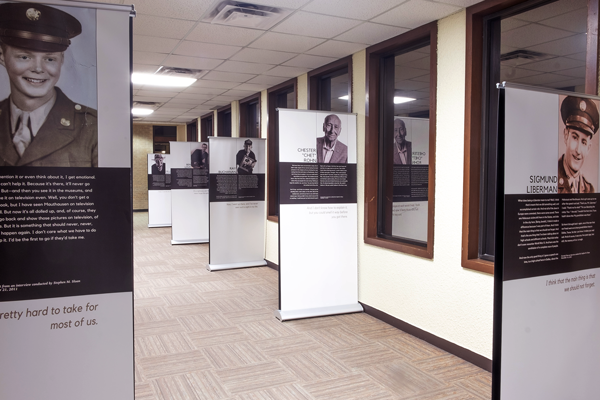 The narratives of 21 Texas Liberators are shared on 21 display panels spread out across campus. The panels include service photos or modern day portraits and a short description of what they witnessed as they entered the Nazi concentration camps. Not only do the liberators recall what they saw and experienced but also how they have lived with those memories and what they felt were their responsibilities as the men who broke open the gates to the German concentration and death camps. Gerd Miller’s panel includes an excerpt from an interview with Stephen M. Sloan in 2013 where he recalls the conditions at Dachau. Miller said they wanted to share their food with them but due to their starved lifestyle, a normal meal would be intolerable for them. “All they got every day — they had these big kettles over fire, and they got, like, a soup that was 90 percent water and cabbage, and some kind of crap in there,” he said. When soldiers arrived at camps, they liberated the prisoners but also cared for the piles of bodies. Ray Buchanan, who is also part of the 21 liberators, shared on one of the panels across campus what his young, curious self saw more than 60 years ago at Dachau. Megan Horlander, a reference librarian, said she was moved to tears while Berg talked about what she felt after watching her father’s tape for the first time. Liberators at the scene were there to clear the camp by helping the gaunt, desperate prisoners and burying the countless and nameless scattered bodies. “You think about the victims but you don’t ever think about the people who went in there and got them out,” Horlander said. Although the exhibit has been up since Oct. 29 and will continue until Dec. 13, Horlander said most people just walk by the display and don’t bother reading the panels. She said Berg’s presentation was emotional and powerful and something people can’t turn their eyes away from. The commission partnered with Texas Tech University and Baylor University’s Institute for Oral History to develop an app, a book and a website for the Texas Liberator Project. These mediums are designed to provide easy and engaging access to the narratives. According to their honor roll list, about 425 liberators were from Texas. Berg said her father suffered from nightmares after returning from the war, and she never got to see his optimistic, carefree side. When she learned about his and other liberators’ stories and talked to their children, she realized they all shared the consequences of World War II. “Because of their experiences in World War II, they wanted us to be better people, but didn’t know how to use their words to say it,” she said. With tears in her eyes Berg took out a letter her rabbi wrote to her father. According to Berg, her father wrote a letter to the rabbi while liberating Dachau. He tried to put into words what he was experiencing so that people in America would know the extreme conditions in Germany. Academic enrichment coordinator Danae Bass said learning about history this way helps encourage students to be involved in their community and become global leaders. She said she felt lucky that the commission worked with Eastfield and brought the materials and the presentation at no cost. Berg ended the presentation by asking guests to remember veterans and thank them and to avoid ostracizing people who are alone, speak a different language, practice a different religion or have different looks. Having empathy and being informed about what is happening around the world helps students create a change in their communities and work with others, she said. Berg said talking about the painful memories helped veterans like her father, and this type of conversation creates empathy. The commission wants to motivate students to be upstanders and speak out about violence and discrimination, she said.